Interest in impact investing concepts that combine financial returns with a positive social or environmental impact have been growing in appeal. What seems to be lacking is a model to encourage broad-based place-based impact investing across all asset classes. For fiduciaries of place-based organizations’ funds, like those at community foundations, pension plans, endowments and many family wealth pools, the HOW of regional impact investing is challenging: The due diligence requirements for what would be a small portion of a portfolio are as stringent as in global investing, but resources are often too constrained to allocate the necessary time and effort to seeking these smaller investments and finding enough of them for diversification, as well as measuring the impact and outcomes of these investments. A central, regional virtual and physical intermediary could perform these due diligence duties, act as a clearinghouse for regional impact investments and be the platform for a broad array of local investment options, connecting capital seekers with capital providers. Picture a family of five separate multi-manager funds, as proposed for the Bay Area Impact Investing Initiative (BAIII)1: public equity, fixed income, real estate, infrastructure and private equity. Each fund is designed to offer benchmark- or market- like returns for each asset class and a positive local impact in the San Francisco Bay Area. • would also include active corporate engagement and proxy voting. Place-based fixed income investments are another financial tool that has impact. Investing in a diversified portfolio of local corporate bonds, directlending pools for local businesses, local SBA loans, and federal agency housing securities can provide market -like returns and be tracked to local impact. The recent study for the Urban Sustainability Directors Network provides dozens of examples of traditional financing tools, like municipal bonds, industrial revenue bonds, and partnerships that can be used by our cities to finance sustainability and climate action plans that reduce GHG emissions. Intentionally investing in our cities is another way to invest locally for impact and new platforms are being developed for local fixed income investing, like Neighborly.com. Real Estate is clearly place-based (location, location, location), and if your mission includes place, then real estate as an asset class offers investment opportunities ranging from single- and multi-family homes, office spaces, and industrial spaces to community space and open space. Sustainable and mixed-use neighborhoods can develop with the tools of finance we have today and generate the multiplier effect of the positive impacts across the region. Long-term financing for infrastructure investment and public private partnerships is needed to address regional issues like congestion and transit-oriented development, access to the internet, education, health, and food security. Building cross-disciplinary partnerships can leverage our investments in sustainable infrastructure. Private equity and venture capital have been the impact investment of choice for mission investors seeking job creation or specific ‘bottom of the pyramid’ solutions globally. Private equity investments, particularly when located in local low- to moderate-income neighborhoods provide much-needed jobs, skills training and a positive community impact. We are seeing innovation in financing these opportunities through incubators and crowdfunding platforms as well. As the business model itself evolves to include themes like ‘profits with purpose’ and ‘doing good while doing well’, social entrepreneurs will need access to capital and private capital needs and wants to find these impactful solutions to our community challenges. When place-based fiduciaries in the Bay Area allocate a small portion (1-10%) of assets to some or all of these local portfolios, the intermediary would manage those portfolios and build deal flow, investment opportunities and partnerships across the capital stack. Delegating the due diligence and management of the funds to a central intermediary and collaborating with other investors for collective impact reduces the costs of managing and monitoring these impact and location-specific portfolios and compounds the impact. For community development investments that are dependent on philanthropic and public grants, private capital could be included in the ‘below-market-return’ portion of the capital stack through tools like loan loss reserves and guarantees, social impact bonds, flexible lines of credit, or low interest rate loans through CDFIs. A collaborative, flexible, collective neighborhood impact pool could aid neighborhood organizations that rely on grants to serve their missions. San Francisco’s Tenderloin neighborhood is home to over 30,000 residents in a ten-block area and has the help of 150 non-profit service providers who work to improve the lives of the residents. Access to capital could leverage the work being done in the Tenderloin for more impact. • the multi-year partnerships for the renovation and renewal of entire neighborhoods like Bay Meadows in San Mateo or “Candlestick Village”, where private and public companies like Stockbridge and Lennar partner with public and philanthropic resources to build new communities in a more sustainable fashion. The San Francisco Bay Area has the talent, wealth pools and robust economy to offer a wide variety of attractive impact investing opportunities to promote sustainability in our region. Collaborating across the financial continuum, across themes like housing, water, jobs, and transportation, and with a focus on our own regional backyard could provide the resources to move the needle on the sustainability and resilience of the Bay Area. Other regions and missions could adapt this BAIII model of financial collaboration and collective impact by developing portfolios and a regional/local platform based on their unique resources and needs. It makes sense that regional resources collaborating to address regional challenges can speed the development of the solutions we need to become and remain a sustainable, prosperous, and resilient community. Please join us for The Road to Centerville: Investing in Regional Collective Impact at the Federal Reserve Bank of San Francisco (101 Market Street) next Monday, March 16th from 1:00 – 6:00pm, including a networking reception. Regional collective impact investing represents an enormous opportunity to use the capital markets to address community-based challenges and tap large pools of assets for scaling programs that work. Marshalling these resources for collective impact has historically been difficult, requiring cutting across program and financial silos to connect capital with opportunity. “Centerville,” a fictional representation of a successful place-based collective impact investment approach, is a call for better coordination of both program and financial assets to achieve sustainable regional prosperity. Join local experts from many disciplines at the Federal Reserve Bank of San Francisco to discuss this type of long-term regional collective impact investing in the Bay Area and other “Centervilles” across the country. 1. The impact investing research paper is now posted on the Federal Reserve Bank of San Francisco website: “Impact Investing for Small, Place-Based Fiduciaries: The Research Study Initiated by the United Way of the Bay Area”, December, 2012. The paper provides an analysis of impact investing, an understanding of fiduciary duty and a step-by-step handbook on how to build a stock and bond fund that is aligned with the mission to reduce poverty in the Bay Area, while meeting fiduciary standards of due diligence and performance expectations. A shorter summary of this paper can also be found here. 2. The Bay Area Impact Investing Conference hosted by the Federal Reserve Bank of San Francisco is set for Tuesday, May 7, 2013. To present both opportunities and challenges to funding and investing for positive social impact and efficient, sustainable resource management while earning investment returns that meet fiduciary standards. For more information contact laurynagnew@sealcovefinancial.com. 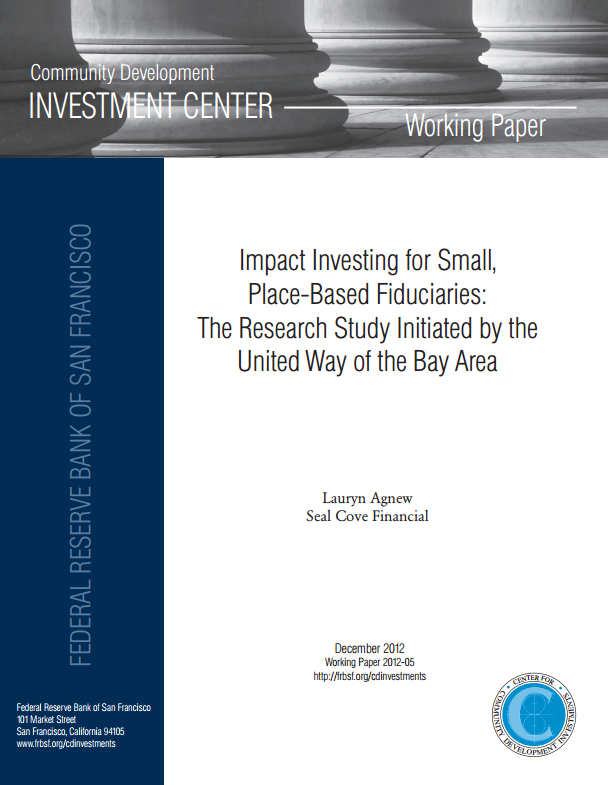 Lauryn’s research study for the United Way of the Bay Area, “Impact Investing for Small, Place-Based Fiduciaries” has been posted as a working paper at the Federal Reserve Bank of San Francisco website. The research describes a process to build an investment portfolio that aligns the investments with the mission without sacrificing fiduciary duty or investment performance. You can download the paper here or view it on the Federal Reserve’s website. Lauryn Agnew serves as a resource to non-profit organizations for investment consulting services, provides fiduciary education and trustee training for public fund and non-profit board and committee members, and offers strategic marketing analysis and asset gathering for firms with specialized investment strategies. Non-profit organizations and public funds in the San Francisco Bay Area have benefitted from Lauryn Agnew’s expertise in policy development, asset allocation, manager selection and portfolio monitoring. Trustee training and fiduciary education are critical to effective board action, and Seal Cove Financial addresses investment and fiduciary issues with boards and committee members. Investment advisory clients have included traditional equity, fixed income and balanced managers, as well as hedge funds, family offices and fund of funds. The predecessor firm to Seal Cove Financial, L.A.B. Consulting, was formed in 1994 in Moss Beach, California, in the neighborhood known as Seal Cove located on the Fitzgerald Marine Reserve, about twenty five miles south of San Francisco.